Severe Blushing Stinks! One Legit Strategy to Make It Go Away. Fear of blushing is a prominent complaint by many with social anxiety. We can hide many things with our anxiety, but blushing totally exposes us. Our body seems to betray the fundamental laws of loyalty and self-preservation. It’s embarrassing and all-around miserable. The physiology of why some of us turn tomato-red at the drop of a hat, and others don’t, isn't totally understood by researchers and doctors. But one aspect that seems to play a big role is how we respond to that dreaded physiological arousal called blushing. When we feel that familiar flush and sudden onslaught of warmth fill our cheeks we instantly get self-conscious. Many times we’re filled with some hierarchy of self-hate. If we can escape a situation we will. If we can hide, even better. All our thoughts get lassoed into one big self-focused bundle and only intensifies the more we think of how red our face is. It creates a vicious cycle. The more we think of how much we’re blushing, the more we blush. The more we blush the more we think of how much we’re blushing. And since it is soooo noticeable to everyone around us, we think about it even more… and want to crawl under the nearest rock. Needless to say, that’s not the response that’s helpful. In all my research, I’ve found two effective ways to help curb severe blushing. The first is an expensive and sorta crazy sounding surgery. Endoscopic thoracic sympathectomy is a surgical procedure where the nerves that cause the facial blood vessels to dilate (widen) are cut. Um. No thanks. The second is teaching those who experience severe blushing to explicitly focus their attention on to anything else but their blushing. Seriously. This is simple strategy an extremely effective way to help people decrease their blushing and cope with their blushing at the same time. Since blushing and self-focused attention mutually reinforce each other, if you redirect your attention outward (to whatever you’re doing and your environment) you’ll be able to break through the vicious circle! Were you hoping there was some secret intervention to stop your blushing in the first place? I know I was years ago when I began my research into this in an effort to help me with my own blushing. But I have to tell you, since I’ve been practicing turning my attention away from my ‘self’ and turning it outward onto what I’m doing, it has become the next best thing! I can definitely vouch for this one. What has helped you? It's confusing. All we hear about these days is self-awareness this and self-awareness that. Everywhere we turn there’s another self-help article on the importance of getting in touch with our thoughts and feelings. And yet, research shows that heightened self-focused attention plays a huge role in social anxiety. It turns out both are, but the devil is in the details. Let me explain. First, the down-low on self-focused attention and social anxiety. Research has found that when a person suffers from social anxiety, they direct too much attention on themselves during (or in anticipation of ) social interactions or performance situations. They pay too much attention to their emotions, their self-thoughts, behaviors, their physical appearance, nervous system arousal, etc. and pay too little attention to what they’re doing, to the other people they might be with, and their environment. With social anxiety, a person becomes acutely and overly aware of themselves. It’s like a giant spotlight has been turned on and focused right. On. Them. Can you relate? I know I can. There are many times in the past when I became so self-obsessed, so self-focused that I couldn’t see the forest for the trees! Miserable. And anxiety provoking. Scientists have also found that when we become so acutely self-focused, we often do worse at the things we‘re anxious about doing in the first place! Add to that, because we aren’t focusing on the other people and things around us, we end up relying solely on our own negative impressions, thereby confirming… we’re a loser. It is a vicious cycle and it totally reinforces our anxiety. But once you realize it’s a cycle you can break it. The way to get out of this loop is to disrupt it. And the best way to disrupt it is to start turning your attention away from yourself. It’s the opposite of self-focused. Yep, I know this also flies in the face of what we think of as being self-aware. So to help with this, let me be a bit more clear about what self-awareness actually means. Self-awareness is just that, being more aware. That’s it. Like, “Oh, I’m aware that there’s a lot of traffic today” or “Oh, that felt really crappy” or “Oh, I feel my body starting to feel anxious.” Self-awareness is merely noticing and noting what is happening or what you are feeling. And it can end there. No need to figure it out or dwell on. Contrary to popular belief, the major benefit to self-awareness isn’t an increased ‘feeling of our feelings’ or ‘thinking of our thoughts’. Actually, that’s often totally counterproductive. The major wisdom of increased self-awareness is to notice our feelings and thoughts and not get pulled in by them. A great way of not getting pulled in by them, after we notice them, is to turn our attention onto whatever we’re doing. Instead of being totally self-focused, we become totally task-focused. We turn our attention outward onto the specific task we’re doing. By doing this one little strategy, we release our tendency to become overly self-focused thereby releasing our anxiety… all while being self-aware! A Whiff of Lavender for Anxiety? C’mon, Really? As with many things, we selectively apply our experiences and logic when it comes to helping ourselves feel better. We’re funny creatures that way. We believe that the smell of bread baking in the oven can make us feel warm and cozy, even a bit nostalgic, and the smell of pumpkin spice can have us instantly jonesin’ for our favorite fall latte, but we don’t believe something like the smell of lavender can legitimately help us feel calm. Or the smell of lemon and eucalyptus can seriously increase your energy when you’re feeling over it. Most of us go through life thinking we are in the driver seat carefully architecting our experiences. Yet, often we have huge blind spots when it comes to feeling better emotionally. We somehow don’t connect some of the easiest dots and overlook some of our most accessible sources of help. Let’s get back to the smell of bread baking in the oven. I want you to feel warm and cozy so you are more open to the idea I’m about to throw on you. And here is the idea: you can use certain smells in the form of essential oils to help you feel better. It’s called aromatherapy and it can help you. The accurate mechanisms of aromatherapy have not yet been identified. Which basically means that scientists don’t exactly know why or how it works. That’s a bummer because we like to know why and how things work in order to believe in them. But here’s the catch…scientists don’t know how and why most things work! Some theories, however, gain ‘culturally accepted status’ as valid and others don’t. If a theory fits into your ‘idea’ of how you think a mechanism should work, “Bingo!” it’s believed. While other ideas, for whatever reason, are relegated to a lesser status and are ignored, even with research behind it. So, forget about lavender or lemon for a minute. “Feeling better” comes down to doing things differently than what we were doing before. Plain and simple. It requires change of some sort. It requires trying some new things and giving up some old things. Aromatherapy may not be “your thing” but it just may symbolize how strong resistance to change can be. If it is your thing, you’re in luck! It is a very effective way to help curb anxiety and can safely enhance your current go-to strategies! Is It Anxiety or 'A Shot in the Dark'? A couple years ago I got a coffee ‘to-go’ from the neighborhood coffee shop on my way to work. I usually have my own mug with me but didn't that day. No problem. Not too long after arriving at work, my body started freaking out. I was sweating, my heart was beating out my chest, I was jittery, my mind was racing and I started feeling panicky like never before. It came out of nowhere and was totally scary. My day was busy and there was a lot on my mind but this was weird. I started taking some deep breaths to try to calm myself down. That worked marginally, but I could still feel my heart and my mind was still racing. I didn’t know what was happening. Was this a panic attack? I’d never had one before but definitely knew about them. At some point, I glanced at my paper coffee cup and noticed the barista’s markings for my order. It read “shot in dark”. “What?” I thought to myself, this was supposed to be just a regular coffee. I then realized that my reaction was a result of accidentally picking up the wrong coffee order at the coffee shop that morning! Instead of my usual coffee, I had drunk one with two extra shots of espresso! No wonder my body and mind were freaking out! I had just bombarded it with a super high jolt of caffeine and it was reacting as I would’ve expected it to. I felt better instantly. Well, my body was still a jittery mess due to the caffeine coursing through my veins and my mind was still faster than usual but once I realized this logical reason for my reactions, I was at ease. It was a false alarm brought on my a ‘shot in the dark’. Upon labeling it a false alarm, all of those symptoms that had captured my full attention and had me so worried soon became a fading-into-the-background noise. My symptoms were still happening but they no longer gripped me with their power. I got back to work and waited it out. You can do this too with your anxiety. There are so many similarities. If you start to feel your body anxiously amping up, check in. If something isn’t immediately requiring your “fight or flight” reaction label it a false alarm. Anxiety triggers false alarms. Teach your mind to settle down with the realization that this type of experience can be attributed to ‘anxiety’ just as my type of experience could be attributed to too much caffeine all at once. Just like my accidental coffee with a double shot of espresso, your anxiety is something real and once it has been activated it needs to quietly run its course in the background. Important point: In the background! Label it a false alarm and then turn your attention back on to what you were doing or need to do. Remind yourself periodically if you need to that you’re experiencing a normal reaction to something that just triggered your anxiety (usually a thought) and that you can let it dissolve. Your anxiety is super uncomfortable because it captures your full attention and usually spirals to become even bigger. Check it. Label it. Forget it. Have you ever had an experience that mimicked anxiety? What happened? How did you deal with it? You’re sitting there in your yoga pants sipping your favorite hot beverage and reading a Reddit article on your phone. Seems pretty mellow right? For the most part it is. But on a sensory level, your brain isn’t resting. There are still tons of pieces of information your brain is processing and staying on top of. Now picture all the information that your brain takes in as you ride down the busy escalator to the packed subway on your way to work. No doubt your brain is working double-time! Fortunately, your brain is expertly equipped for both situations, and all situations in between. So let’s pause a moment and give your brain the props it deserves. Nice work brain, keep it up! Thank goodness too, that your brain isn’t the complaining type. From a cognitive perspective, information is costly to take in, store, manipulate and retrieve. The more information it is presented with, like the subway station during rush hour, the more taxing. Don’t be fooled just because your brain makes it look easy. It’s not. The way your brain is able to function efficiently during even the most stimulation-dense situations is through various short-cut systems it has at its’ disposal. One of the most common is the use of narrative. Narrative, or the way you explain things to yourself, fill in the blanks when you don’t have facts, and the stories you tell yourself, creates patterns. Patterns are easier for your brain to recognize and manage than tons of disparate bits of information or things that don’t make sense. There are many types of patterns your brain relies on. Causality, that is logically progressing from cause to effect, makes for an efficient narrative and is a common ‘go-to’ pattern for our brains. A story that progresses logically in this manner is easier to neatly package than one that takes wild twists and turns and may not wrap up nicely. It’s no surprise that an overworked brain likes causality. And no surprise then, that we quickly come up with answers for everything, explain anything that comes across our paths and try to avoid uncertainty at all cost! We feel better when we know the why of things and when things ‘make sense’ to us. We even feel better when we totally make things up that fit that bill. We end up telling ourselves a lot of stories that increase our impression of understanding, without needing them to be based on reality. Increase your comfort level with uncertainty so you don’t automatically explain things you don’t know. The more you understand how your brain works and practice fine tuning it, the higher performing your brain will become without negatively effecting its’ efficiency. We’re all bargainers. No, not like the world class ones you’ll encounter as you nudge your way through the busy shops of the Grand Bazaar in Istanbul, or wander through the famous stalls of Jemaa El Fnaa in Marrakech, or get lost in the maze of the ancient markets in Delhi. Few of us ever reach that level of bargaining. Most of us feel utterly uncomfortable in these types of haggling situations. We avoid them at all cost. And if by total accident we ever found ourselves there, we’d be counting the days until we were back in the safety of fixed price tags! We think we prefer things a more concrete and non-negotiable. The funny thing is, we’re constantly negotiating. If we were to turn up the volume on our awareness, we’d shock ourselves with how often we are wheeling and dealing…with ourselves! Here are some examples. Have you bargained with the anxiety gods that as long as you keep your anxiety they will protect you from really bad things happening? Or convince yourself that as long as you keep your worry front and center, you’re being responsible and ‘fighting the good fight’ and that it will eventually pay off? Or have you traded your ‘peace of mind’ in exchange for providing for your family? The problem with this type of internal bargaining and negotiating is that it is a one-way street. The other side might be at the table but they aren’t signing the contract. So, because in our minds so much is at stake, we end up with exceptional follow-through. We live up to our side of the bargain and worry, keep our anxiety, avoid certain things, even throw in a panic attack or two, and the other side? Well, they’re still not signing and there are no guarantees that they’re going to come through for us. Would you EVER enter into a business deal like this? Even if your job doesn’t require making deals…logically does this make sense to you? We need to shed some light on the bargains we’ve made with some unreliable counterparts. Constant anxiety in return for life turning out ok. Lack of sleep in order to ensure business success. Chronic worry in order to guarantee my kids stay safe. Being overweight in order for my kids to get to their activities. Panic attacks to stay employed with my demanding but high paying job. We need to ask ourselves if this is the only way that we will get the outcome we are wanting. Do I really need to wake up anxious in order for my life to turn out ok? Is the picture I’ve painted for my life the only picture that will work? Is being afraid of losing what I have or what I want to have the best way to keep it? Ask yourself some real questions along these lines. We need to experiment with other options. We can always return back to an anxious reaction. In a screwed up kinda way, anxiety will actually even feel comfortable because the known is always more comfortable than the unknown. But, we need to try out other reactions to address and deal with what is totally stressing us out because anxiety isn’t effective and makes life complicated and sucky. The key when we’re experimenting is to actually give the new reaction repetition and time to see if it works. Too often we try something once or twice and determine it doesn’t work. Our anxiety has had plenty of time and practice so we owe the same to other strategies! Cut ourselves some slack. I know, that goes against all the hard-a$$ ‘wisdom’ out there. It flies in the face of all the self-critical cheerleading that has become the sacred path to success in our culture. Most likely you’ve been going that way too. It really doesn’t work for the long haul. So, maybe throw this one into your experimenting cycle too. You’re not going to the opposite end of the spectrum, lighting patchouli and telling yourself, “It’s all good.” You’re merely accepting a little bit more of being human, having reactions that make sense, and doing your best to make changes going forward…minus the self-flagellation. Backing out of a past negotiation with your anxiety is ok. I think your anxiety is expecting it any day now. Remember playing in the sand at the beach when you were a kid? You’d dig a hole in the dry sand with your hands only to have the sand slide back in and fill in the hole as you go. It often felt like one step forward, two steps back. When our bodies are low in GABA or serotonin it can have that ‘one step forward, two steps back’ effect on our anxiety, our ability to calm ourselves or our mood in general. We try to feel better and shake things off but we just don’t seem to get any traction. Fortunately, there are some natural things we can do to help get these two important levels back in balance. These suggestions don’t require major overhauls of your life, just little tweaks here and there. Little tweaks, when practiced consistently, can make huge changes so please don’t brush them off and continue with your status quo. Your life is too important for that. Also, if you’re like me, knowing specifically why you’re ‘doing this’ or ‘not doing that’ is extremely motivating! For example, in the past when I would hear something about the importance of reducing stress I would think to myself, “Yeah, yeah, I know…” But once the dots were connected with stress’ contribution to low GABA and serotonin, figuring out how to reduce stress seemed particularly valuable! 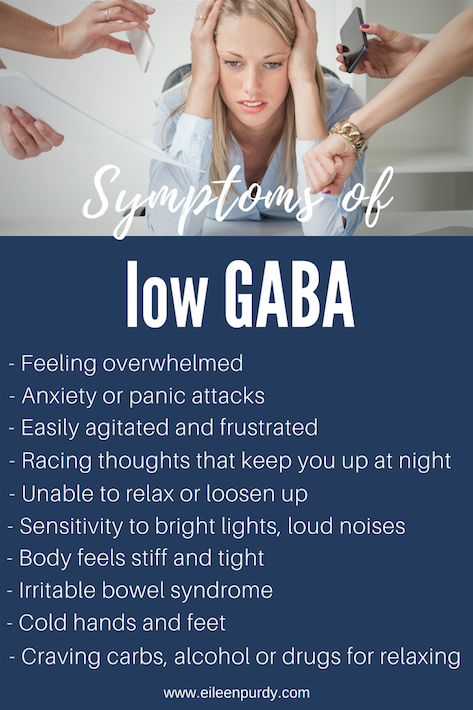 If you want a quick reminder of the different symptoms for low GABA and low serotonin, I listed them here . 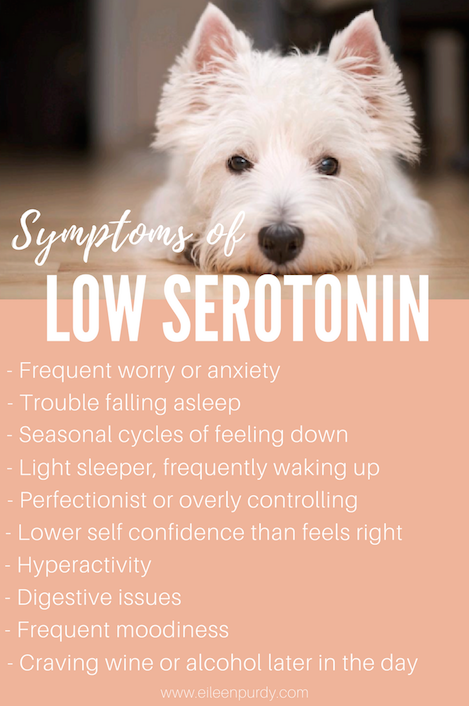 Serotonin is also an inhibitory neurotransmitter that helps us with impulse control, pain relief, appetite, sleep and is probably best known for its role in helping to create a positive mood. 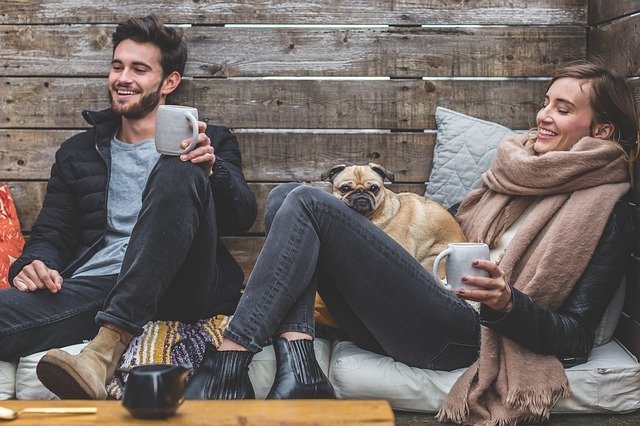 If you are interested in getting more information on how these two neurotransmitters might be affecting how you feel, make an appointment with a functional medicine doctor near you. If you don’t live near one, there are some wellness centers online that do tele-consultations. Leave comments below if you’ve had particular success with this! I’d love to hear what worked for you. But after a few of these comments it got me thinking what could I say to someone if they wanted my quick 2 cents that would be helpful, universally effective, and that could be called on when needed? If I had to give one piece of truly helpful advice, here is what I came up with. It's an If/Then plan to use each and every time you start getting those anxious thoughts, feelings and body sensations. Label it. Label the fact that you are feeling anxious and having anxious thoughts. Label the fact that your body is responding in an anxious way. Label that you're having self-critical thoughts. Call it out in a direct, objective way. “I’m having anxious thoughts" or " My body is getting that anxious feeling" or "I'm having self critical thoughts." Don’t go into why or why you’d like them to stop. Simply label the thoughts, feelings and body sensations you’re having as anxious thoughts, feelings, body sensations. Less really is more here. Turning your attention. When this happens, turn your attention onto something else. After you label your thoughts, feelings or body sensations, letting your brain know that you’ve received that message, turn your attention on to something else. Preferably back to what you were doing or need to be doing but literally putting your attention and focus on anything other than your ruminating anxious thoughts will do the trick. In the beginning, it will feel like you are plying your mind away from the stickiest glue you can imagine. It’s that tough. But over time it gets infinitely easier! From your experience, what do you think? What would be the #1 thing you’d suggest to a person to try?